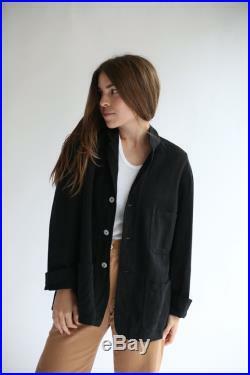 Vintage overdye black blazer chore coat with three front pockets and three white button closure. Lightweight cotton good for transitional weather. 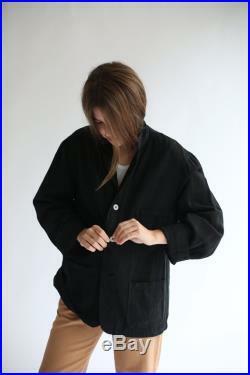 Material: 7.5 oz cottonmade in usa in the 50s or 60s. Garment dyed in los angeles 2018. Condition: excellentx-smallshoulders: 14"chest: 17-18"length: 26"sleeve length: 21"smallshoulders: 16"chest: 19-20"length: 27"sleeve length: 22"mediumshoulders: 17"chest: 21-22"length: 27"sleeve length: 22.5"largeshoulders: 19"chest: 24"length: 27"sleeve length: 22.5"x largeshoulders: 20"chest: 26"length: 27"sleeve length: 22.5"hannah is 5'3.